TIP THE SCALES IN YOUR FAVOR! As a successful business person or sales professional, you’ll experience incredible highs. Exhilaration. Victory. Awards. Recognition. Money. Pride. Achievement. You’re at the top of your ride. Building momentum. Gaining speed. Soaring toward an infinite sky. Yet, at times, you may feel as if you’re whipping around unknown curves. Plummeting through darkness. Falling uncontrollably. Doomed for disaster. Customers, clients or prospects won’t take or return your phone calls—or reply to your e-mails. They suddenly have selective memories. And at worst, some lie. Inexplicably, things careen out of control. And you have no control. The sure-thing, the done-deal, the no-brainer heads south. Your decision-maker who already gave you the “thumbs-up” changes his or her mind. Is demoted. Fired. Or even dies! Impossible? Nope. They’ve all happened to me! Because, nothing happens until somebody sells something! Somebody like YOU. You make a difference. 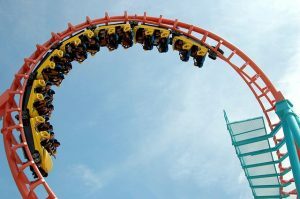 Business development and selling are a great ride—with far more highs than the unfortunate, yet occasional lows. So hop on, enjoy your trip. I’ll meet you at the top! The preceding is excerpted and adapted from Jeff Blackman’s bestselling book, RESULT$: Proven Sales Strategies for Changing Times. This entry was posted in Results for Life and Business, Uncategorized by Jeff Blackman. Bookmark the permalink. Jeff is a Hall of Fame speaker, best selling author, success coach, broadcaster and lawyer. His clients call him a "business-growth specialist." If you hire speakers, please contact Sheryl Kantor at: 847.998.0688 or [email protected]. And visit jeffblackman.com to learn more about his other business-growth tools and to subscribe to Jeff's FREE e-letter, The Results Report . Jeff's books include; Stop Whining! Start Selling!, (an Amazon Bestseller), and the new, revised 5th edition of the bestselling Peak Your Profits. You can also stay connected with Jeff via Facebook, LinkedIn and Twitter.